Students in the M.S. 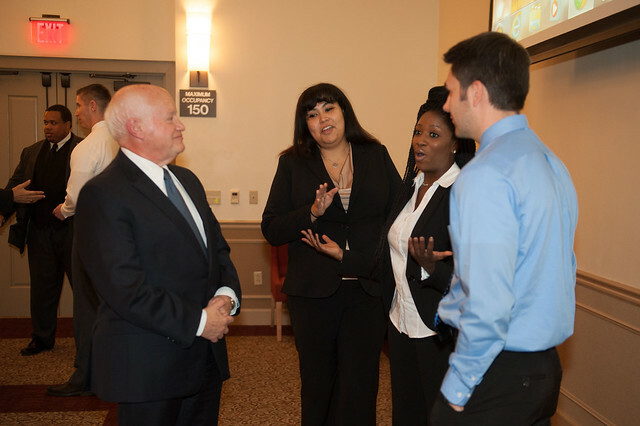 in criminal justice administration program capstone seminar course at Point Park University presented their research Dec. 10 on a variety of topics, from prisoner recidivism and human trafficking to the debates surrounding police body cameras and the USA Patriot Act. "The students selected their topics and decided their own course of research. This included literature reviews and statistics research as well as interviews with community experts in the field and studies created by the students," explained Richard A. Linzer, J.D., visiting associate professor and interim director of the criminal justice administration program. LaShaun Davis: "The Impact of Faith to Prisoner Recidivism"
Craig Genser: "The Debate Behind Police Body Cameras"
Chris Kowalczyk: "The USA Patriot Act and the Fourth Amendment"
"I chose my research topic because of my passion for prison ministry," remarked Davis. "I want to work with those who are incarcerated to help bring about their rehabilitation. I also want to give back to the community and by doing so, I hope to transform lives and prevent crime." "Most researchers have primarily focused on the sociological mechanism of crime but fail to realize the importance that religion and spirituality have in the criminal justice system," added Davis, who earned a bachelor's degree in business from Point Park in 2010. Criminal justice alumnus Genser also decided to continue his studies at Point Park. "I thought, 'Why not put in one more additional year and in return, receive a master's degree?' I knew that while it would be a rigorous year, it would be well worth it," said Genser, whose career goal is to be an officer for the City of Pittsburgh Bureau of Police. "I decided to pursue a master's in criminal justice administration because of the vast job opportunities that come with an advanced degree. The criminal justice field is constantly evolving so there is always more to learn," said Jones. Jones added: "I'm hoping to work within the federal government and fight human trafficking on an international level." "Sgt. Perry Vahaly of Allegheny County Police, who died in an accident and was a graduate of the criminal justice administration program, was my inspiration to pursue a master's degree at Point Park," remarked Kowalczyk. Kowalcyk also discussed how the law enforcement expertise shared by Linzer over the past year was critical in helping him understand the issues that affect the criminal justice system today. "Our graduate program, including these research presentations, prepares our students for positions where they use the knowledge and skills they have gained to serve our communities and society as a whole and show employers they can be counted on to perform at a high level," said Linzer.